Hi guys! It's your resident Packaging Ambassador, Rebecca, here and I bring you good tidings! Actually, I have good tidings and not-so-good tidings... The bad news is that I have only a very short post for you today. The good news is that I'm sharing an exciting sneak peek at something I couldn't be more excited about and you'll see me again this month, on November 15th!! I've waited and waited for the holidays to get here, since it is the biggest packaging season of the whole year. 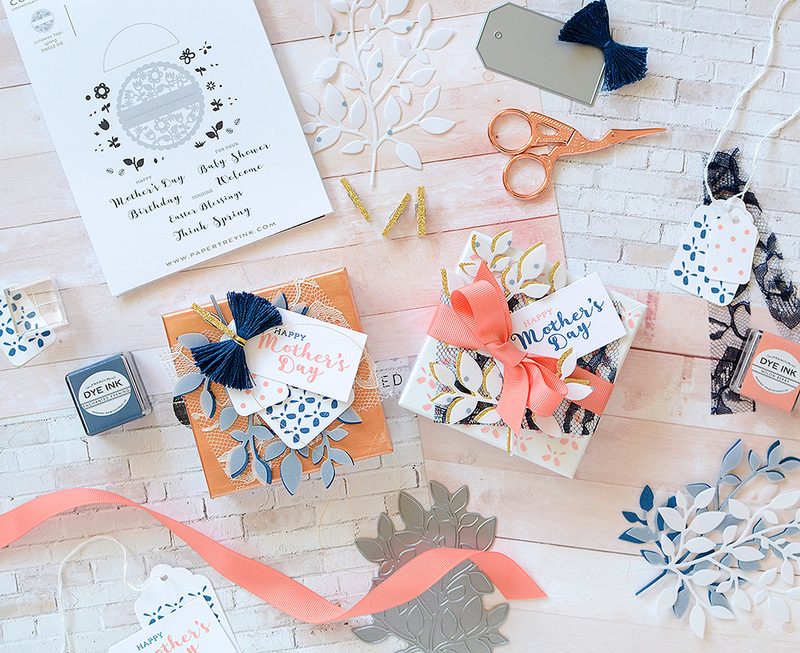 And this year, thanks to Papertrey Ink, I get to GO BIG with a Holiday Gift Wrap kit! 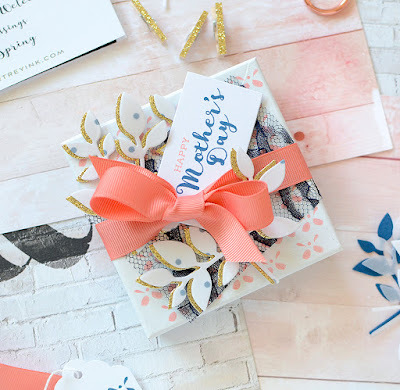 It's called Good Tidings and I've had the pleasure of curating the entire thing--from the stamps and dies to the ribbons and tags, it's a collection of my favorite things for packaging gifts. 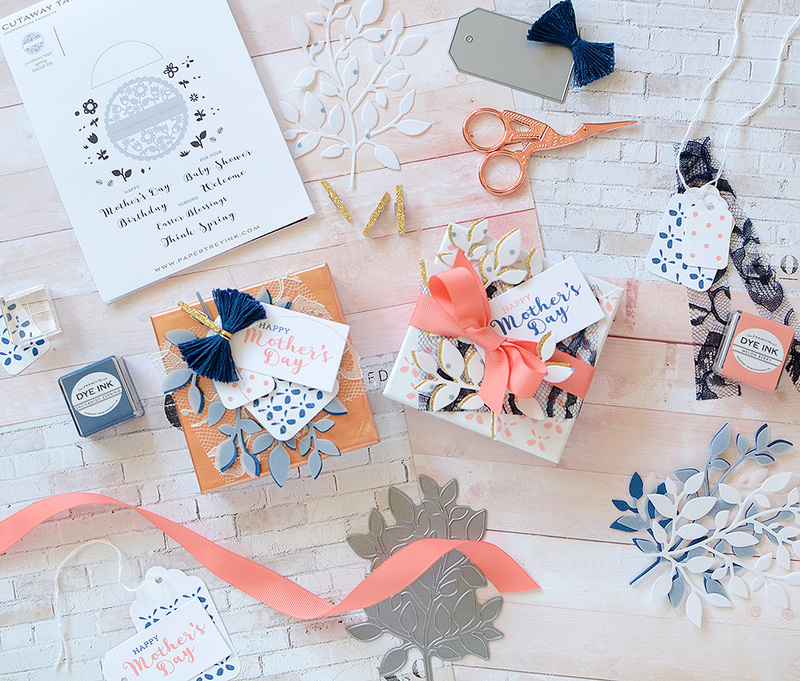 Good Tidings is an essential holiday gift wrap kit. Short of wrapping paper and cello tape, it has everything else one might need to wrap a large assortment of Christmas gifts. It’s designed to be traditional, elegant, and sophisticated, while remaining versatile and fun. My mindset toward designing this kit was FUNCTION. This time of year is chaotic for most people, and the approach to a Christmas packaging kit should be to provide a plethora of products that serve to alleviate the disorganized chaos of the gift wrap table. 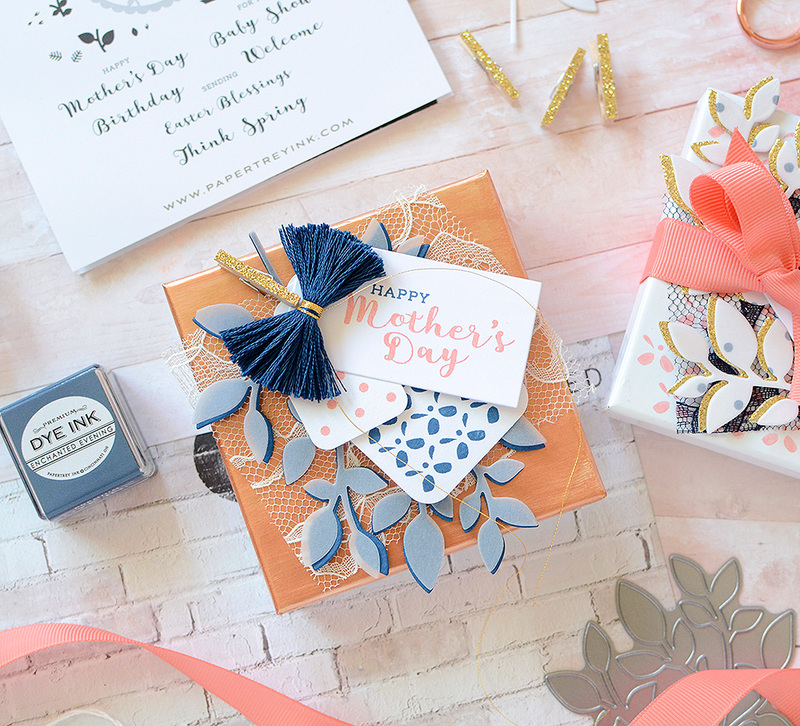 With a mix of pre-designed gift tag sheets, sticker labels, and patterned papers, along with some ‘DIY’ staples like a stamp set, a gift card holder die, and a handful of coordinating image dies, (and ribbons!) you'll have everything you need for wrapping right at your fingertips. Please join me back here on November 15th for the release and reveal of my Good Tidings kit--I have so much to show you and I hope you won't miss it! It's my favorite time of year--and favorite time of the month! Welcome to October's Papertrey Ink Packaging Ambassador post...let's fall in love with fall today, shall we? There's something about this time of year that gets my creativity brewing--and, no, it's not pumpkin spice. It's more likely the fact that it's time to ramp up for the holidays. They. Are. Coming. It's chaotic, it's exciting, it's a change! There's a color shift--bye bye bright pink and cheery yellow, hello ochre and deep green. There's an image shift--see you later flamingos and pineapples; welcome back feathers and pine branches. There's a mood shift--so long heat exhaustion; so good to wear you again comfy-cozy layers! With so many exciting new (and some familiar) things to think about, fall packaging is high on my list. And the majority of my autumn packages include leaves! To be quite honest, I use leaves all year long; why should we leave them to languish during the winter, spring, and summer months, to be pulled out only as autumn's orange glow settles upon us? One thing I love most about autumn projects are their color schemes, and I'm adoring what I've put together today...shades of orange, gold, off-white, and deep, dark hunter green--better known to us here at PTI as Pinefeather. Allow me to sing the praises of Pinefeather for a moment. I think it's the "it" color of the season, and it's a color with which I'm reacquainting myself after a 20-year hiatus. Funny how the cycle of trends and fashion goes, isn't it? Whenever I think of hunter green, I think of the car my parents drove with immense pride back in the 90's. It was a dark green Buick Park Avenue with the "Gold Package" and while it was a smooth ride and offered some nice luxuries for its time, I hated gold and I hated hunter green! Tell me, am I turning into my mother, proudly wrapping up my "gold package" with hunter green ribbon??? Anyhow, fall is the beginning of gift-giving season, really. For me, personally, we celebrate quite a few birthdays this season, and then it's onto Thanksgiving--hostess and 'just to say thank you' gifts galore--then, of course, there's the Big One in December and all the presents that go along with it. Christmas holidays and birthdays aside, this is such a beautiful time to be grateful and thankful and go just an extra step or two if you can. With that said, I've wrapped a couple of gift boxes up for thanks-giving. They include leaves (of course!) and Pinefeather ribbon, and easy gold accents. They're elegant--the kind of decor you might think of when you picture a sophisticated Thanksgiving tablescape. Not mine, mind you--oh, no, we gather at our table in comfy clothes, eat off of mismatched dishes--or even paper plates, but the fancy kind so that's classy, right?--and if we're not eating turkey dinner that was mostly prepared by a favorite local restaurant, then we're eating spaghetti and lobster. When I look at these gift boxes, I'm obviously thinking of someone else's fancy tablescape. Let's talk about these leaves first, since the whole idea started with them. Is it their shape that makes me want to put them on all projects all year long? They're just the perfect thing to tuck behind elements, and I've long-loved to do this. I made the majority of my leaves with Rustic White cardstock. I didn't really want to use bright white, but I wasn't sure I wanted to go heavy cream, either, so I chose the Rustic White and it was a good choice. It was a bit flat, though, and I wanted to add some texture to it. 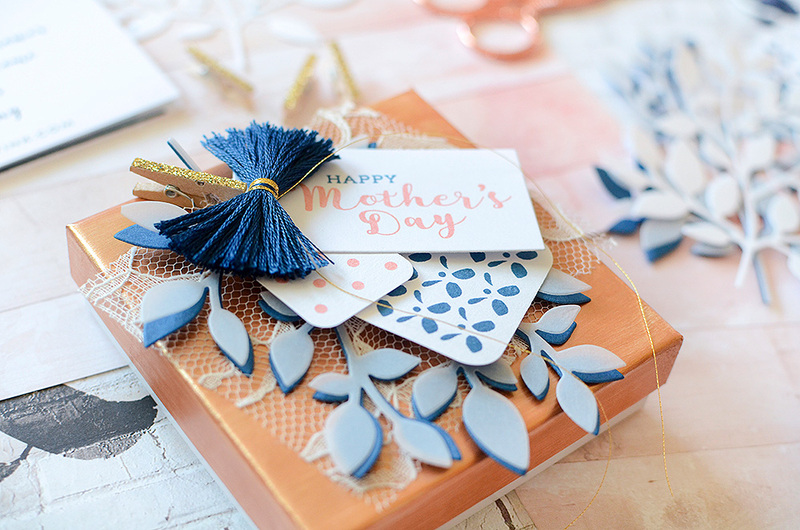 Most of you probably have impression plates for this and can make all kinds of beautiful textured patterns on your cardstock. Unfortunately, I'm without those for now, but I think I'm starting to see their value! Anyhow, in a pinch, I decided to try running my paper through my die cut machine with a piece of burlap over top of it. What do you know, it worked! I ran it through around 4 times and when I was done, I had a burlap texture impressed into my paper. It's not quite as refined or uniform as the PTI Rustic Burlap plate, I'm guessing, but in a pinch, it did just what I needed it to do! I cut some leaves out of my transformed paper and wanted to add a couple more details to them. With a bone folder, I scored some 'leaf lines' into most of the leaves. There is also a stamp set that coordinates with this die if you'd rather stamp the lines or the entire leaf image instead. I thought about adding some glitter to the leaves, just at the ends maybe, and another time I will do that, but for the sake of not wanting to clean up a glitter mess, I instead added a gold border to each leaf with a paint pen. It's quick-drying, and requires little clean up so I was able to do all my project leaves in about 5 minutes, which was awesome! The paint pen is from Marvy-Uchida, and I normally pick them up when I'm at Joann. I cut a few more leaves from gold glitter paper and peach crepe paper to have some variety of color and texture. I wrapped a length of peach crepe paper around my kraft box; this box is 8" x 6". This was followed by a strip of lace, and then the contrasting green ribbon, tied in a bow on the right side. I added the fringe bow on top of the ribbon bow. After that, I began assembling the 'pile of leaves' that would nest above the trims. To do this, I just play around with them, trying each of them out in different spots and positions, alternating between the white leaves and the glitter leaves. I knew I wanted to add a sentiment somewhere to this set up, and this was a factor I considered whilst arranging the leaves. In the end, I decided on stamping 'give thanks' onto an oak leaf. The sentiment is from the Autumn Pumpkins stamp set and I definitely wanted to incorporate an autumn or Thanksgiving message to each of these boxes. 'Give thanks' fit so nicely across the oak leaf, stamped in Canyon Clay ink, and I placed it at the front of the bouquet. When I had an arrangement I was happy with, I began adhering them in place. As I normally do, I chose not to add heaps of glue, and instead went with my daughter's preschool teacher's mantra of 'dot, dot, not a lot.' It's sound advice for adult crafters, too! By not cementing the leaves down, I can curl up their edges and get great dimension. In between a couple leaf layers, I curled up some metallic gold thread for one more whispy accent. From the leaves, the gold, the shades of orange, plus all that beautiful texture and the scene-stealing Pinefeather ribbon, you can tell that 'Autumn's here'. Instead of 'wrapping' the second box, I made a gift topper for it. Many of the same elements are used on it as the first box, but there are a couple of substitutions. Mainly, I went with a large tag for my sentiment, and swapped out the Pinefeather ribbon for some vintage green velvet ribbon that belonged to my grandmother. Because of the way I used the crepe paper and lace this time, I wanted something just a bit wider than the 5/8" grosgrain; this velvet ribbon is 1 inch. With the Tag Sale #1 die, I cut the tag from more Rustic White cardstock textured with burlap. Again, I've outlined it with the gold paint pen, and stamped 'choose to be grateful' in True Black ink. I added a gold resin flower for a little detail and dimension. Using some of the leaves I created at the start of the project, I began arranging them just as I had earlier, though I used fewer leaves here due to the type of packaging I went with. I clipped the tag and 2 leaves to the ribbon bundle and adhered a trio of well-placed leaves underneath that. Again, dot, dot, not a lot, but enough to hold the clothespin in place, and enough to secure the bottom 3 leaves to the box. The last touch was another pale orange fringe bow, and the package was complete. The good thing about this gift topper is that, due to its size and make up, you can use it on larger boxes or clip it to a gift or wine bag if the size of this box doesn't work with the gift you're giving. I'm so pleased with the way both of these boxes turned out; I guess it's no wonder that we dig out our favorite leaf stamps and dies when the weather turns cool--but seriously, they don't have to hide away during the other 3/4's of the year, do they? Join me next month when we move straight into Christmas wrapping, because, packaging... You can bet the lovely Pinefeather will make another appearance for that! Happy wrapping, friends! Hi friends! 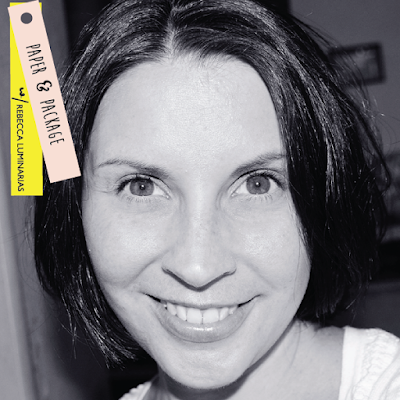 It's the 6th of the month and that means I'm here with my new Packaging Ambassador post! You were all incredibly kind after last month's post and I'm so glad you enjoyed the tassel tutorial (for which you waited so patiently). I hope you've had a chance to try making a few! I actually have NO tassels on my projects this time around--GASP! It's a rare occasion that I make a project without one but I think you'll enjoy this post since I'm continuing on with the card packaging theme. It has been a frequent request, and while I touched on it last month, I've jumped in with both feet this month, making the cards and all! Let's get to it! Last month I used muslin bags and they are convenient for so many things. We don't all have them at the ready, though, so today I chose something I'm certain you ALL have (or will acquire again soon)--plastic card boxes. Specifically, I used the boxes that Papertrey Ink stamp sets come in. I don't know about you but I have always kept them, even though I take the stamp sets out. I guess it's because I used to make a lot of cards and they're convenient for giving or sending cards that have 3-dimensional elements that will get squished in a standard envelope. Let's discuss a couple factors to consider when using these boxes: They do come with the paper band around the top of them, which shows the stamp set housed inside. The paper band has a bit of adhesive on it that keeps it in place. The simplest thing to do is remove it and wrap your own paper band in it's place. 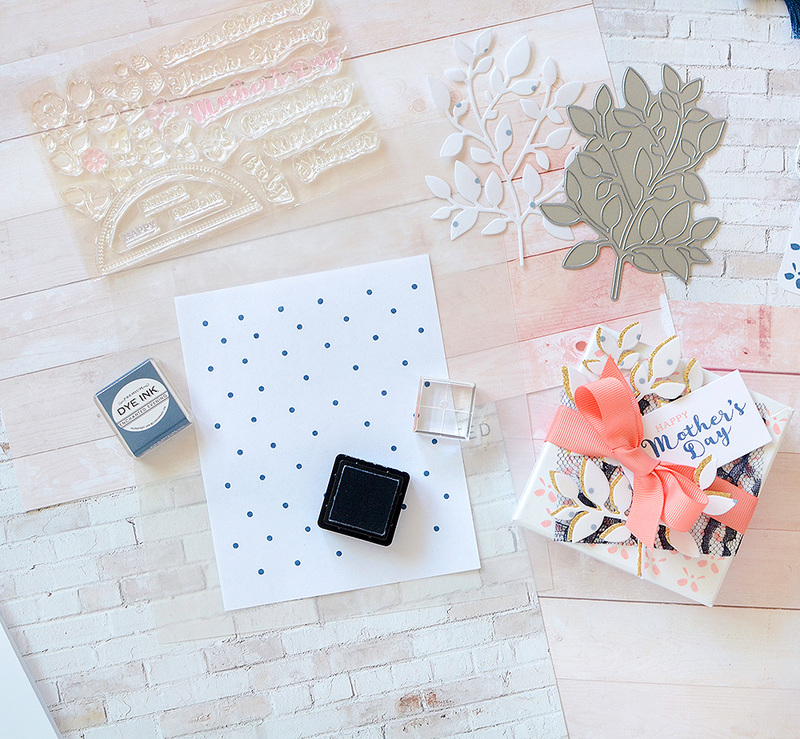 Use patterned paper or paper on which you've stamped a design. Simple. Easy. Maybe you've even done that before. I didn't do that. I kind of like the bit of motif that's on the front of those bands so for 2 of my techniques, I incorporated hints of them into the packaging design. For these boxes, I made simple notecards to put inside, paired them with envelopes, and wrapped them up to give away. They are simple because 1) they're flat notecards and space for writing is essential; and 2) the focus of the post is the packaging. I focused on creating something colorful, eye-catching, and minimal. I wanted to make a portion of the notecard a part of the overall design and it took a couple of tries to get it right (which is why you may see some different-looking notes in the unwrapped stamp box photos! Full transparency: It happens to all of us! The first tries don't always succeed, so you work until you achieve something you're happy with. The boxes are an A6 size, meaning they fit cards measuring 4.5" x 6.25". I thought I could get away with using an A2 card size (4.25" x 5.5") but they didn't look right when I tried to package everything up and that's why I had to start again. I went with a larger size, some different colors, and different placement of my stamps. I'm so much happier with the way these turned out, too, so it seems it worked out for the best this way. The packaging styles and elements are similar for these boxes. You can save yourself some time by not trying to reinvent the wheel for every single package. After my first attempt failed, I had to come up with a new plan and that takes time. While I would have loved to create completely new and unique concepts, there simply wasn't time, so I adapted. And I'm not sorry because I love what I turned out in the end. DON'T make the process stressful or it won't be fun anymore--I can't stress that enough (apologies for the awful pun)! 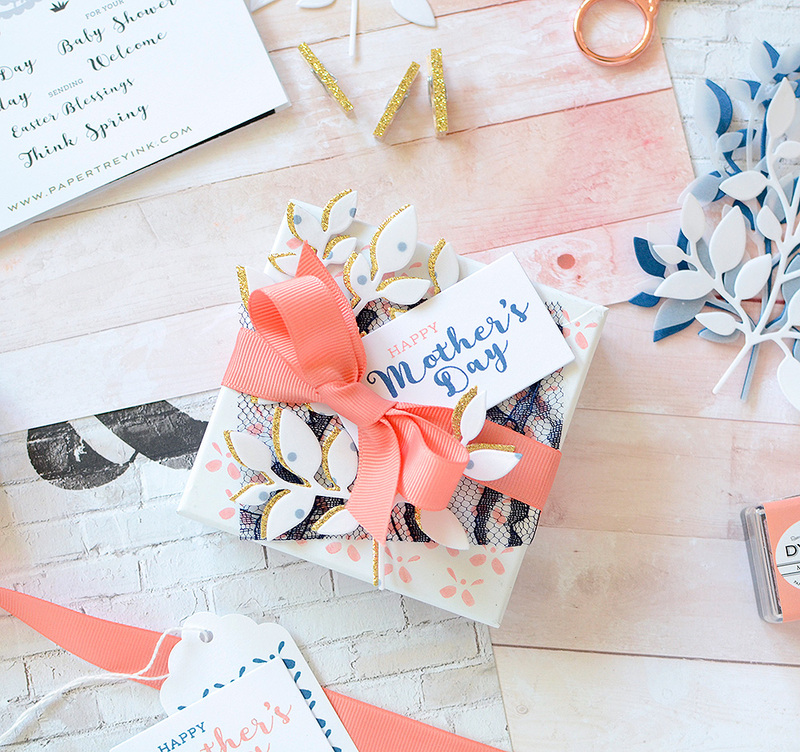 This is meant to be fun--we're hobbyists and for many of us, papercrafting is our relief at the end of a long day or busy week. Do what is fun, don't worry over an idea that doesn't work out--make a few tweaks to a standing design instead. The cards in the first set feature stamps from Fancy Foliage in Tropical Teal and Bright Buttercup inks. I colored in some of the leaves with Melon Berry ink and a blender pen. I then paired my notecards with Curry envelopes from Paper Source (they're a great match to the BB ink). Using the box that the set Fresh Floral Wrap Ups came in, I let a bit of the orange chevron peek through. There is black type on the band also, so I could only allow a hint of the orange to be seen, but I think it's just enough to add some interest at the top of the box. With a 4" white paper doily, I covered the rest of the text; I'm aware that a few black spots are visible through the lacy cutouts, but that's fine--again, interest and depth. Simple tags came next, using the Fillable Frames #9 die and the long strip from the Bow Clips die. I cut 1 tag and 1 strip out of gold glitter paper (I HAVE to have some shine in there! ), a tag from Melon Berry card stock, and a strip from white card stock. It takes a few plays to get these details right most of the time. There's adding elements and taking them out, placement preference, and multiple stamps in multiple colors. Do you do that, too, or is it just me? In the end, these are the elements, colors, textures, and placements that worked. I then played around with some trims. Melon Berry ribbon (not enough contrast), Ocean Tides ribbon (a bit too far from my color palette), the pink burlap string that came with the Lovely Laurels kit (not thick enough). I tried out the Aqua Mist Twill Tape and LOVED it, so I decided on using just a bow with the pink string. All the colors and textures work so well together here! My next box of notes features images from Fresh Floral Wrap Ups stamped in Tropical Teal and Summer Sunrise. 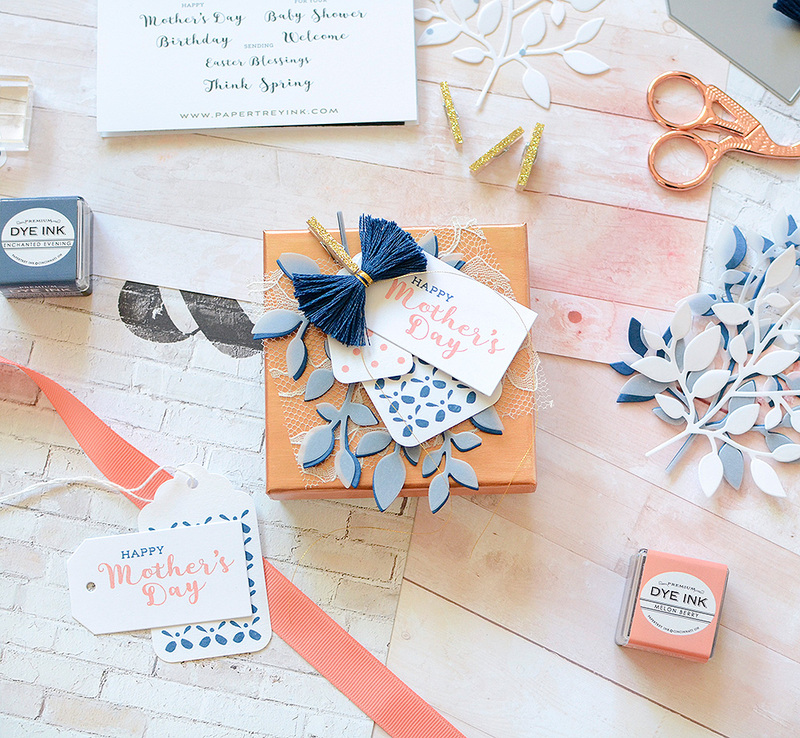 I did plan the colors around the stamp box I was going to use--teal and orange from the Text-Style logo. I'd been using Tropical Teal throughout ALL the projects in the post today so it worked out well. It's such a rich, saturated shade and contrasts so nicely with many of the warmer colors that I wanted to feature it here, too. I made this package of notes landscape instead of portrait, knowing the paper band on the box would be to the left side instead of the top, as in the previous set. Again, though, I chose my stamp placement based on what would be seen in the bottom right corner of the package, wishing to incorporate that peek into the overall package design. As before, I played around with the placement of elements--the tags, doilies, and ribbons--before settling on the final design. I followed a similar pattern to the first card box, using 2 die cut tags and 2 of the banner cutouts of the Bow Clips die. I stamped "Love You" on the white cut out with a little Summer Sunrise leafy flourish. 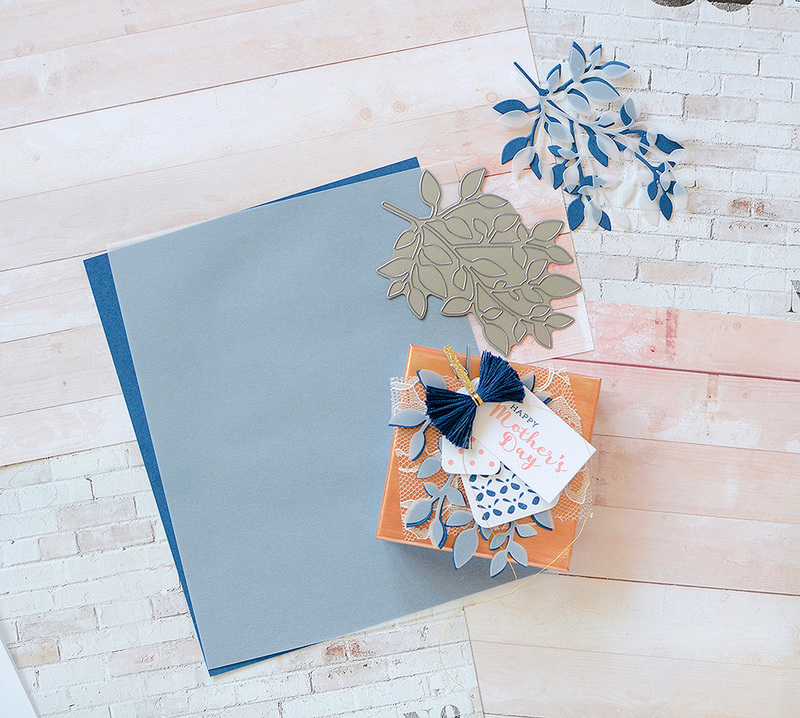 How about a fun box covered in brightly colored crepe paper?! If you read last month's post, you'll remember the die cut of the little cake stand from Cloche Quarters. I mentioned that I took the idea from some cards I made in preparation for this post...The gold glitter cake stand die cut with a cute felt bow is a quick and easy birthday card! I made 2 with color variations and then whipped up 2 more quick cards with a stamp and die from the Lovely Laurels kit. I haven't decided whether I'll give all 4 as one set or divide them into 2 sets, but being as bright and festive as they are, they deserve a matching package! This is so easy to do, too! I'm using a roll of pink crepe paper which is nearly spot on to Raspberry Fizz. I found it at the dollar store, which is where I get a lot of my crepe paper rolls. After removing the original paper band from the stamp box, I ran a strip of double-sided tape across the bottom of the box, about where the middle of the paper streamer would be. It's a bit hard to see in the photo because it's clear tape on a clear box, but hopefully you get the idea. The I just started adhering the crepe paper, gathering or ruffling it as I went along. When I got to the edge of the box, I trimmed it. I repeated these steps all the way to the top of the box, trimming the excess again when I reached the top. So easy! Going along with my other packages today, I used more tags, lace, a little tulle, and an Aqua Mist twill bow atop a fun pile of shredded pink paper scraps and gold fill (also found at a discount store). A little white tag stamped with XOXO denotes a sweet gift and it's all ready to give. It only took 5 minutes to put together! There are so many fun ways to package up your special handmade cards so I know this will not be the last post I write about the subject. Today's ideas were about being simple and thoughtful, and using a product many of us, if not all PTI fans already have--the plastic card boxes. It's always handy when you already have a box to use instead of trying to hunt one down online or at a craft store, right? 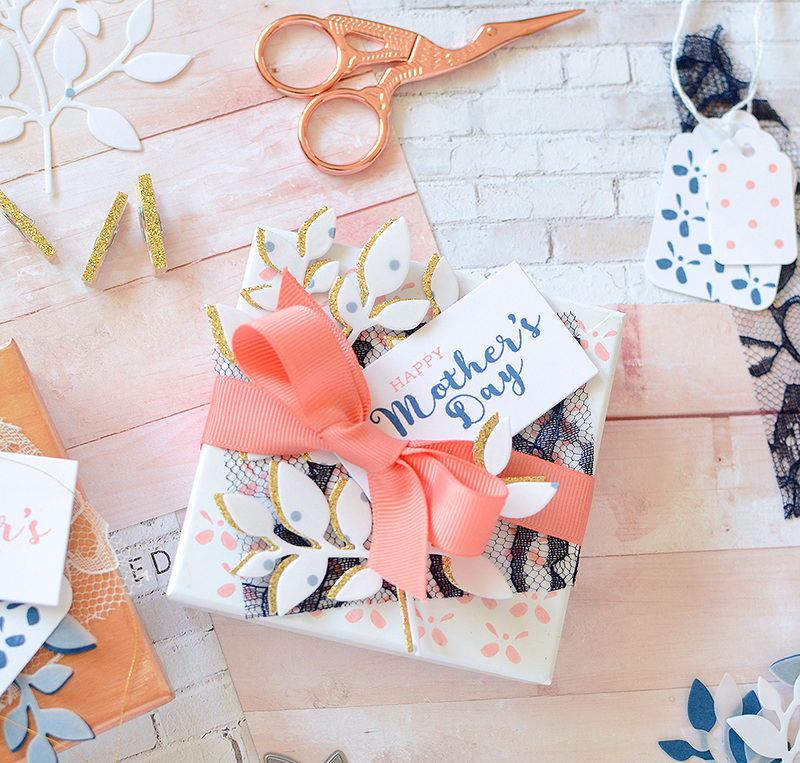 Until September 6th, happy card making (and packaging) to you!! 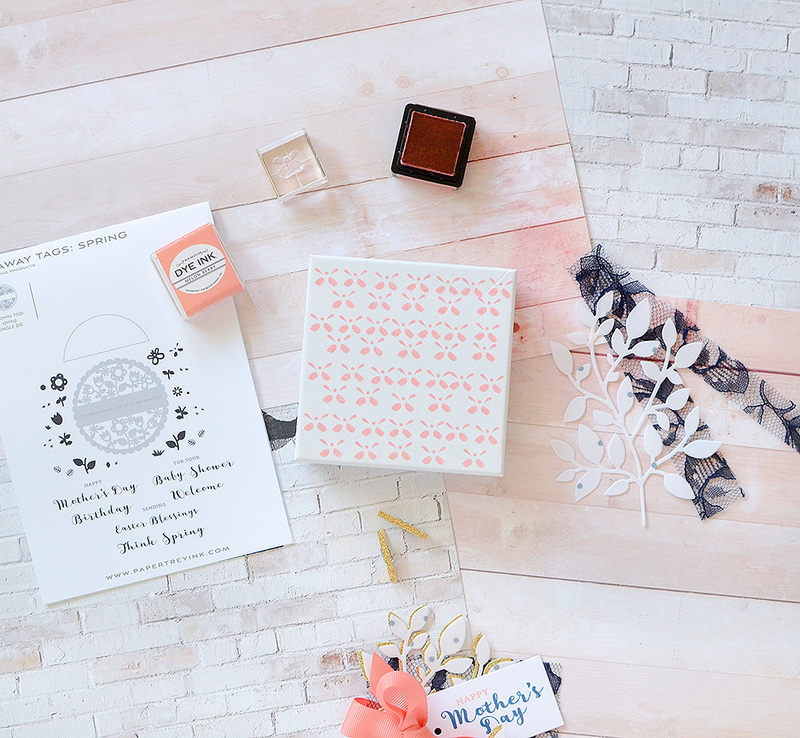 It's the 6th of the month which means another round of Papertrey Ink Packaging!! We're settling into summer now and I've cooked up some pretty packaging featuring muslin bags and the Cloche Quarters die. Who's ready for cheery colors and pretty florals?! To kick things off, though, I'm going to get right into the long-awaited Tassel Tutorial. It's a good month for this, since I featured them in my projects (of course), and because I used a few different colors of DMC floss that coincide with PTI hues. Thank you for patiently waiting for this...I hope you'll find that it's quick and easy! My preferred jump ring size is 10mm (which I have found at Joann, but I buy them in bulk from Fire Mountain Gems). I normally use embroidery thread in Light Gold (though whichever kind of thread you prefer is at your discretion). The first step is to choose an end of your skein and spread apart the natural loop (see below). You'll be slipping the jump ring around the top of the loop so you'll also need to open up the ring. I do this with my fingers, but if you're familiar with making jewelry, you probably have a tool for this. Perhaps something like these pliers? I'm not a jewelry expert, which is why I use my fingers!! ...and close the jump ring (again, I push it closed with my fingers, but if you have manicured nails, you may want to use pliers instead). The next thing to do is wind thread tightly around the floss, by which you bind the jump ring in place. Wind the thread around several times, tie off, and trim the end excess. If you'd like to, repeat the same steps to make a tassel at the other end of the skein. Using a pair of sturdy scissors, cut the tassels off at your desired length. Mine are roughly 2" - 2 1/2" long, and I'm left with a similar bundle of floss from the midsection. Basically, I've cut the skein into thirds. Clean up the ends of your tassels with a few choice snips and you now have 2 tassels ready for adorning your projects! Back when I started making these, it seemed like such a waste to throw out the midsection, so I kept them all in a bag until I had an idea of what to do with them. I can never resist a little bow (as you'll see later on in this post) and fringe bows in the vibrant floss colors quickly became staples of my craft work. I simply tied a knot around the middle of the loose bundle and evened up the ends. Voila! A cute bow and 2 tassels in just a few minutes. The tassels add such a color pop to projects--they are rich and saturated, even in the softer hues. I will sometimes choose a lighter or darker shade of floss to complement the existing colors in a project. The spectrum of peachy-oranges would have been so pretty here, for instance. Although, in the end, I opted for matching shades or Harvest Gold and New Leaf, because I couldn't resist the added deep green. Now let's get to the projects! Muslin bags are one of my favorite ways to contain gifts. They come in a wide range of sizes and you can sew on, stamp on or dye them to suit your needs. I buy them in bulk from Uline, but you can also do an Etsy or Amazon search to find them in smaller quantities and different sizes. I use them for packaging in my Etsy shop often, filling them with multiple clothespin sets, greeting cards, and tag sets. The contents of my mini packaging kits are always contained in them. 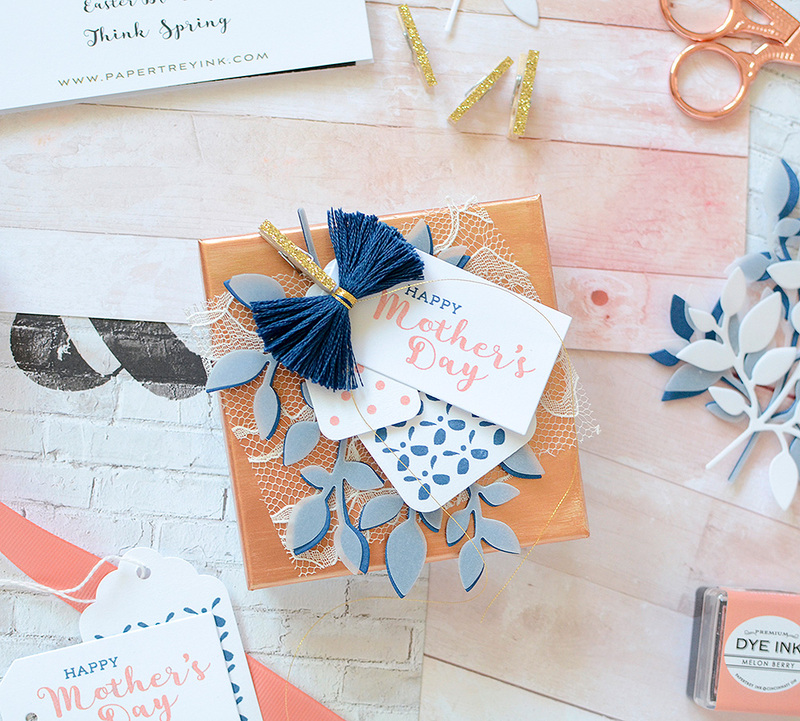 A few of you have inquired about card packaging and while today's project does not focus on cards, this is a great card packaging idea. I recently acquired the Cloche Quarters dies, and to be honest, one reason I chose them was because I thought they would make really cute tags in their solid form. I didn't cut out the center, as seen in most of the CQ projects--though you still could do that and have a result that works out just as well. The nice thing about these dies is that they're made to be versatile and their uses are open to interpretation. With some PTI felt and floral stamps, my end product was just what I was hoping for. I've started with a 4 x 6 bag (a great size for 4Bar or mini cards!). I like to decorate the bag itself sometimes, instead of just adding tags and trims to the tied off part. Stamping on the bags is always fun, but here I chose to use 3-dimensional pieces instead. Little bows are some of my favorite embellishments so I made some out of the Bow Clips die and PTI felt. My colors on the first bag are Harvest Gold, New Leaf, and Melon Berry, so I made the bow with MB felt. One of the dies in the Cloche Quarters set is a mini banner, which I've cut from glitter paper and I created a simple focal point at the bottom of my muslin bag. I glued down a small swatch of lace, followed by the banner, and the cute felt bow. I used Fabri-Tac and it's a good idea to place some wax paper inside your bag to keep the front and back from sticking together and accidentally sealing the foot of your pouch! The small scene is mainly for balance and interest, but your recipient is more likely to re-use it (I think) if it's decorated. The addition of the bow screams 'GIFT BAG!' and it's a great way to wrap a gift without technically wrapping it. Since I'm not glueing any of the tags onto the bag, other tags can be substituted when the gift-ee is ready to be the gift-er. 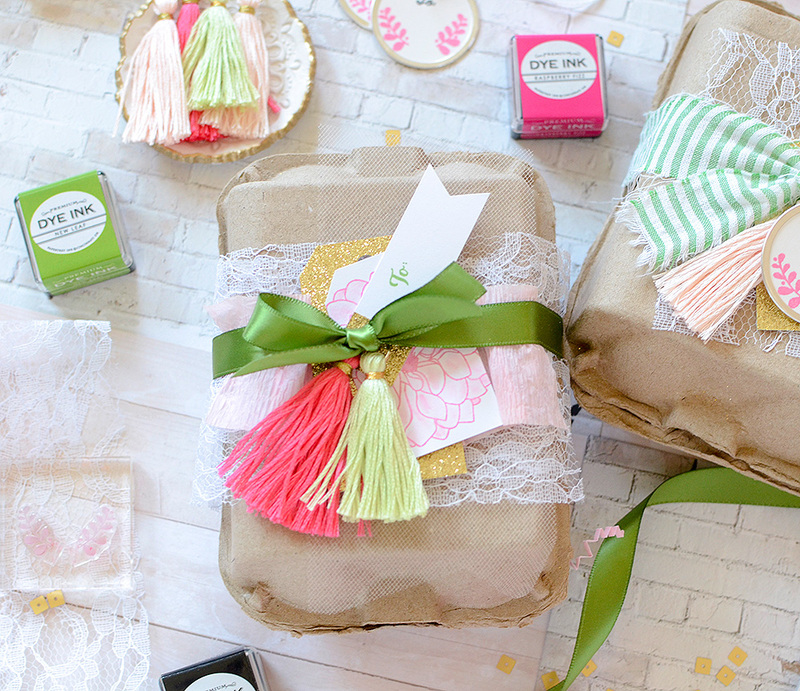 Using a smaller muslin bag is a quick way to package up gift cards, too. Speaking of tags, let's get to that part now! I cut a large cloche from MB felt, and a smaller one from white card stock to matte with it. The cloche pairs come in 2 sizes and I used the smaller ones here. I chose to stamp flowers from Fresh Floral Wrap Ups in Harvest Gold ink and the leaves and stems in New Leaf. A small scrap of lace sandwiched in between the paper and felt added a bit of my beloved texture, and the colors all worked together for a pretty, summery tag. One large cloche, cut this time from card stock, completes the set and serves as the place to write the recipient's name. I stamped 'to' in New Leaf (the stamp is part of the Keep It Simple: To & From set). When I put the tags together, I fanned this one out in order to keep the important part of the bottom cloche visible. Now to put it all together...The first thing I did was string metallic gold thread through the top of the felt cloche. I punched a 1/16" hole through the card stock cloche and slipped that through the gold thread, also, linking the tags. I tied the gold thread to the twine of the bag in a double knot to ensure it held. I looped 2 embroidery floss tassels onto the bag twine, too. I added a few lengths of colored seam binding and a bit of gold eyelash trim, then gathered the draw strings of the bag and tied everything in place. My second bag is the same idea as the first, but with slight differences. I've used a larger bag--5 x 7 this time, which houses A2 cards expertly. I've kept Harvest Gold, but replaced Melon Berry and New Leaf with Raspberry Fizz and Sweet Blush. I also used all large cloches here. This project is a bit of a teaser to what I have lined up for next month's Packaging Ambassador post, which will feature several ideas for card packaging (those do not include muslin bags!). To go with card packaging, I needed to make some cards for context, and you might just see a form of this idea on a celebratory card next month! The style of cloche bottom I chose here reminds me of a cake stand and when cut from gold glitter paper and topped with a bright pink bow, it's too cute not to be a birthday card...But you'll have to stay tuned for that next month. For today, the glittery cake stand, a pink bow, and some lace all look very festive on this muslin gift bag. Again, I used the larger (longer) cloche set for this bag and cut the base from RF felt. My florals and stems were stamped with Harvest Gold and Sweet Blush and when I put it together with the RF felt, I fell in love with the colors. As you might notice from some of the photos, I tried out a few other floral combinations but this one might be the one I like the best. You never know until you start playing around what really works. I mean, they all work because the PTI colors ALL match unbelievably well, but this really array stood out! While a different style, the 'to' is from the same KIS: To & From set as I used on the previous bag. As a serial gift wrapper, it's an essential stamp set for me. Harvest Gold and Sweet Blush tassels here, along with soft seam bindings and pale pink eyelash trim, and my second gift set is complete. I hope you found some good inspiration here today! If I haven't covered your exact topic yet, it's likely coming up in one of the next few posts. In the meantime, try to incorporate some of these techniques or packaging ideas into your desired interest. I know you can do it! You come to Papertrey Ink because you're crafty and you enjoy being creative. I've loaded you up with 4 months of ideas (not to mention what can be learned from the rest of amazing Papertrey gals, as well as what YOU already bring to the table). I've been hearing from a few of you who are putting these tips to task and coming up with fantastic results. I love to hear about and see what you're getting up to so keep at it and keep sharing! On deck for August: Card Packaging! Until then, take care and enjoy your summer! Happy May, friends! It's the 6th of May and that means it's Rebecca taking over Nichole's blog again with a new Paper & Package post. Next weekend we celebrate a very special day here in the US: Mother's Day. It's a day to express your love and thanks to a very special lady; in my case, my mother has passed so it's also kind of bittersweet. While no one can ever take her place, I am fortunate enough to have a mother-in-law and an aunt who I consider to be like 'second moms' to me. In my packaging post this month, I'm going to be altering the boxes, as well as dressing up the topping with stamps and dies. I've gotten each 'Mom' a small trinket of appreciation and, of course, each one must be wrapped up in the loveliest way possible. Thanks to a few supplies from Papertrey Ink, they are! I'm so pleased with the way these turned out! The colors, for one, are stunning--Melon Berry and Enchanted Evening mixed with gold and copper. I also love when you have an idea for something, and what you're envisioning turns out even better than the image in your head. That doesn't always happen for me, but, luckily it did here, especially considering the importance of my recipients! The Cutaway Tags: Spring stamp set ended up being the catalyst for this project. One obvious reason I chose to use it was for the brush lettered 'Mother's Day' sentiment. As I was deciding what other images I was going to use, 2 tiny stamps from that set stuck out. I had gone in with the intention of creating a floral scene with some of the leaves and flowers from it, but then I saw the little butterfly fill-in, and it reminded me of an eyelet pattern. When I stamped it in repetition in the Enchanted Evening ink, I was in love! The second image was nothing more than a tiny dot. It's supposed to be the center of a little daisy-like flower, but I made myself a Melon Berry polka dot pattern with it and when I was done, I had a complementary tag to my blue eyelet tag. I then had to decide how I was going to use the tags. I really wanted to use them with the Branching Out die, but I also wanted them to stand out against the box. Because there was quite a bit of white already, due to the white tags, I thought they might be a bit pale against the white lid of the box. So I thought, what if I painted the lid? Decisions like this are always somewhat anxiety-inducing for me, because if they don't work out, then what?! I'll have to hunt down a new box and come up with a new plan, which can sometimes be time-consuming. Luckily, after messing around with a few different shades of gold, I found that the Martha Stewart Copper Metallic produced the color I was looking for, and looked so pretty with my navy and peach elements, really drawing out their beautiful hues. I had my tags and my box, but now what to do with that leafy branch? My original thought was a vellum die cut and I did do this in the end, but not before trimming a second sprig from Enchanted Evening cardstock and placing it loosely behind the vellum branch. This provides some extra depth, and also offers a trio of hues--Enchanted Evening, frosted EE, and opaque white--instead of just one frosted blue. 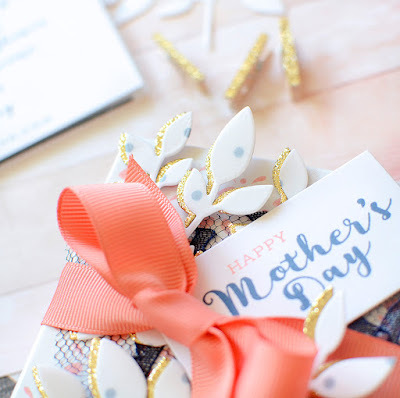 I made one more tag with the Fillable Frames #9 tag die and Mother's Day sentiment from the Cutaway Tags: Spring set. I snipped the Mother's Day stamp in two so that it would fit on the tag. Because I make a lot of tags, which are typically not as wide as cards, I often end up trimming my phrase stamps this way. Don't be afraid to try it--it opens up so many new possibilities and sometimes it's even fun to mix and match with other sets to create your own sentiment! The last pieces of this package were a swatch of off-white lace, a mini glitter clothespin, and an embroidery floss bow. I used the DMC shade 3750, which is a terrific match to PTI's Enchanted Evening. Moving onto the second package, I decided to try a little stamping on the lid this time. I loved the little "eyelet" pattern on the tag from the first package so much that I braved creating something like it on the lid. 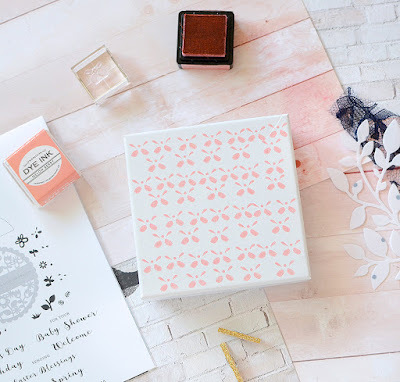 Using Melon Berry ink and the butterfly fill-in, I stamped repetitiously along the box. I knew that some of the pattern would be covered up, so if I made a mistake, if wouldn't be a big deal, but luckily, the stamping went pretty well. I'm such a fan of this tiny little stamp! It creates such a pretty pattern of eyelet or lace and I love when a stamp meant for one thing can be used for another, don't you? The second box has similar characteristics, but is definitely its own style! I made another "Mother's Day" tag, but stamped the phrase in the opposite colors of the first tag. I also used the branch die again, and while the layering technique is similar to the first package, there was a little more work involved. Again, I wanted to use the vellum. While I was cutting the first vellum sprigs, I placed a simple piece of white printer paper underneath it, since my cutting plates are pretty cut up and I didn't want the feint lines of past cuts to come through on my transparent vellum. I just used a scrap piece of paper that had some handwritten notes on it. When I pulled the pieces apart, the vellum stuck to the printer scrap and it looked sort of cool, inspiring the idea for the vellum matte. But I decided to stamp a polka dot pattern in Enchanted Evening ink on the printer paper instead of using the scrap. It only took a minute or two to do the stamping and the result was a frosty, patterned branch that I adore! Because I liked the effect of layering up the sprigs slightly offset, I did it again here, choosing to cut one of them out of gold glitter paper for a little subtle sparkle. I also used a swatch of lace underneath the fun stuff, but I chose navy this time. It's a nice pop of dark contrast to the lighter stamped box, branches, and white tag. I finished off this package by tying a length of Melon Berry grosgrain ribbon around it, and tucking my stamped Mother's Day tag under the bow. I think these are good enough to send off to 2 of the most important ladies in my life for Mother's Day ;) I know they'll both appreciate my effort, and I've got a new appreciation for patterns and sweet, tiny stamps! Utilize your actual package! 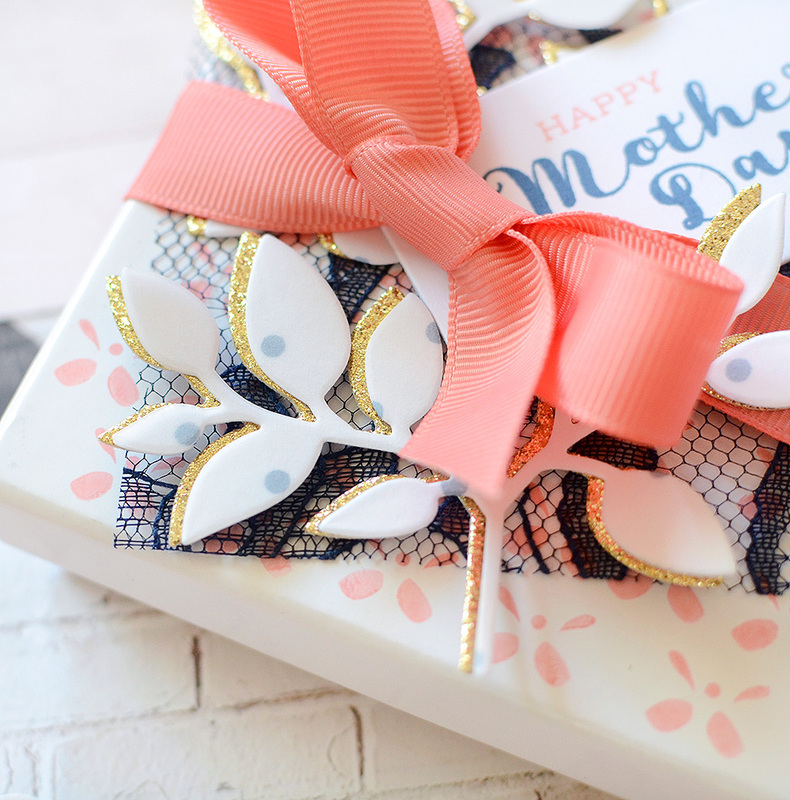 Don't be afraid to alter the outside of the box or bag with stamps or paint, especially if you need to add some extra interest of contrast. Do more with your stamp sets! 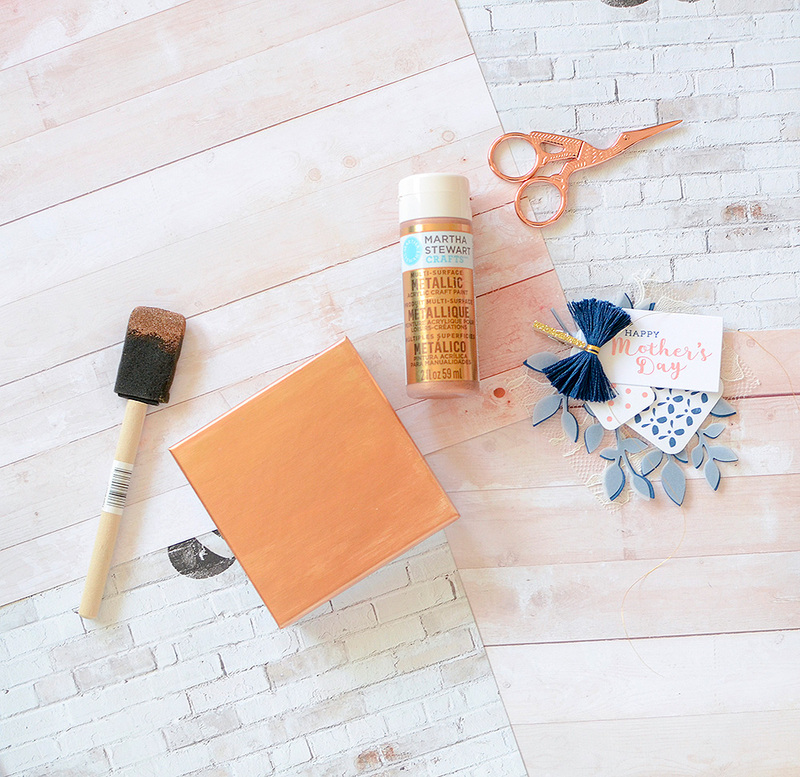 Create patterns with the tiny fill stamps--or any stamps, for that matter. Also, if the phrases are too long or tall for your surface area, a strategic cut might be an easy solution. Card Set packaging from MERRYF: That is a fantastic idea and it's absolutely one I'd love to explore in an upcoming post. Thank you for suggesting it! I LOVE that you're finding these posts helpful and I want you to know how much I appreciate your questions, suggestions, and sweet comments. I'll see you back here in June!